"The Fabric Construction Makes a Difference"
When considering the properties of a fabric that are appropriate for applications in the outdoor market, there are certain aspects that designers consider—breathability, weight, durability, drape, softness, water-repellency, thermo-regulation, etc. However, there is a more basic aspect to think about. That is the fabric construction, and how a specific fabric construction impacts the garment functionality and performance. 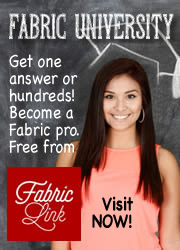 Most fabric constructions fall into 3 categories: woven, knitted, and nonwoven. Laminate and composite constructions are also popular in the outdoor market. While fibers and yarns obviously affect the properties, appearance, and wearability of the fabric, the fabric construction also influences the properties, appearance, and feel of the fabric. For example, the physical properties of woven fabrics differ from the properties of knitted fabrics, even when the same yarn is being used. The type of construction can also affect performance properties such as durability, breathability, and stretch, to name a few. Designers and product developers need to select the right fabric construction, based on the end-use application. The FabricLink Network reviews how fabric constructions from three textile manufacturers that exhibited at ORSM'18 are impacting the outdoor market. Aerojac™ engineered 3D Body Mapping construction. Eclat Textile Company introduced its newly engineered 3D Body Mapping Jacquard fabrics, featuring two innovative knitted jacquard constructions at the show. Booming markets like athleisure, fitness, performance, and outdoor activities, which combine casual fashion and sportswear, have driven this trend into a lifestyle, and Eclat's 3D Body Mapping Jacquard Fabrics work perfectly into this category. In the past, this type of technology could only be produced on seamless knitting machines. However, Eclat's unique technology is being produced on flatbed-knitting machines. The Eclat Series Aerojac™ fabric has an engineered mesh structure for high ventilation and pull-push moisture control for a comfortable, functional, and well-dressed look. The Eclat Series Crossjac™ construction produces a groove texture, body mapping, and a 3D look and feel, all within one fabric. The new Eclat technologies allow for a multitude of design possibilities in cut-and-sew garment construction, which it claims produces a better body fit versus seamless. The uniqueness of the construction lies in the use of special flat knitting machines, where the yarn turns on the front and on the back of the needle beds to form a tubular fabric. The complete garment is connected, formed and engineered through the machine's stitching movement. Nike and Under Armor are currently using Eclat's Innovative 3D Body Mapping technology in their upcoming activewear lines. 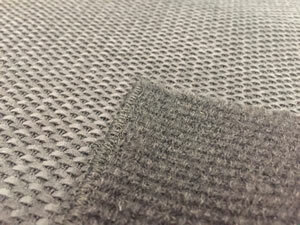 Toray's plaited knit fabric, utilizing Slit Ultrasuede® yarns on the face. Toray's Ultrasuede® showcased its Slit Ultrasuede® yarns for knitting at ORSM'18. The nonwoven luxury of microfiber Ultrasuede® is well-known as the world's first ultra-microfiber fabric and has been providing beauty and elegance for decades. The Slit Ultrasuede® yarn is created by slitting Ultrasuede® sheets into 1.5mm, 2mm, 3mm, 4mm, etc. widths, as requested. The Slit tapes, made from the finest micron fiber (1/20 of the diameter of a human hair), are used mainly for knitting and weaving. Conscientiously engineered, Ultrasuede® is both versatile and easy-care, exceptionally durable yet luxurious, and modern yet classically stylish. Ultrasuede®'s strength lies in its elegance. The multifunctional fabric feels like natural suede, but is resistant to stains, odors, and discoloration, and can be machine-washed. Since Ultrasude® is a non-woven fabric, it cannot pull or fray, and avoids sagging, crocking, pilling, and shrinking. Optional antimicrobial treatments are also available. The highly abrasion-resistant Ultrasuede® also ages better than real suede, is stain resistant and is animal friendly. The fabric is used for fashion; bags; upholstery and interior furniture design; automotive, marine and aviation interiors; accessories; footwear; and as covers for mobile devices, and beyond. woven fabric with a TPU coating. NUWA Inc., a division of Honmyue Enterprise Co., is a Taiwan based woven textile company. The company is a leading performance fabric supplier of high performance woven textiles, engineered for a wide variety of uses. The end products are delivered to a full line of industrial, furnishing, and apparel markets. Honmyue has professional fabric protection technology that converts the woven textile into high performance fabric. In different end-used products, focus on differing performance qualities, such as waterproof, water repellent, abrasion resistant, breathable and waterproof, anti-stain, anti-bacterial, anti-static, flame retardant, color fastness, UV protective, and deodorant. At ORSM'18, Nuwa showcased a highly printed 100% nylon woven fabric with a TPU coating at ORSM'18. 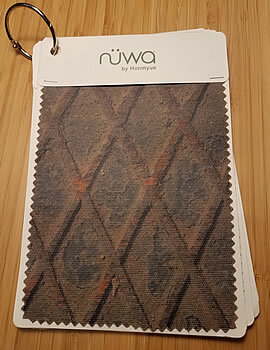 Nuwa's specialized Allegro machines, along with the company's product development expertise, has been able to create and produce a three-layer laminate fabric, consisting of a woven base fabric (either nylon or polyester), a high definition pigment printed mid-layer, and a thermoplastic polyurethane coating (TPU) top layer. The fabric is printed before the TPU coating is added on the top. The printed fabric is eco-friendly, weldable, and migration resistant.